This site lists the known descendants of Thomas Quint (First person of the name "Quint" to be referred to in America, taxed 1684 in Greenland, NH). Most of the genealogical data was based on the "Records of the Quint Family of Maine & New Hampshire" compiled by Marion L. Dunn from Family Records, Deeds, Wills, Vital Statistics, etc. Contributed by Elizabeth Wadsworth Chapter, D.A.R. (Typed by Mrs. John Linsky, Jr. Portland, Maine 1949-1950 (Recorded on LDS film # 40768). "The Quint Genealogy" by Charles N. Sinnett (typewritten 1925, available at NYC Public Library) was also used for information. The data was organized and placed in computer format by Ray Parsons using the Brother's Keeper software program (by John Steed). Lineage including Dates, Names and Places are on the ROOTSWEB internet site. A GED of the data collected was transferred to the ROOTSWEB site at http:/www.rootsweb.com/ To find the data, go there and click on FAMILY TREES at the top of ROOTS WEB page, then enter QUINTTHOMAS in the box for the NAME OF THE DATABASE. There are over 2000 names of individuals related to Thomas Quint in the database. By sending my GED to Root Web the first names of "living" individuals aare replaced with "LIVING" and all dates associated with them are deleted. If no death date appears in the GED then the individual is listed as "living" if born less than 100 years ago. This may cause some deceased individuals to be listed as "living" but this helps to reduce "idenity theft". 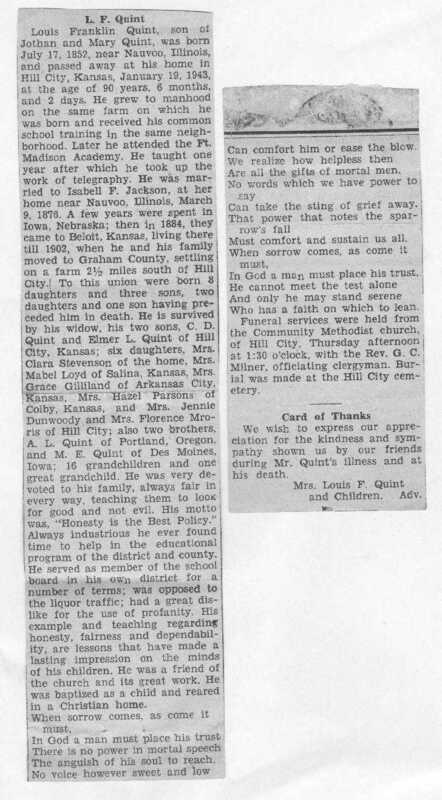 My father, Philip G. Parsons, and mother, Hazel K. Quint, were active in collecting genealogical data on their families. In addition to the dates and names they collected stories written by individuals and relatives. 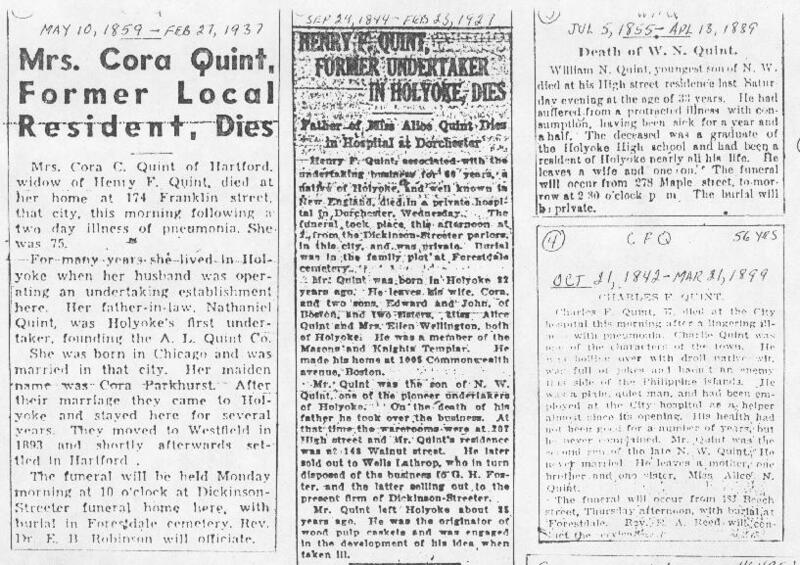 Stories of "Quint" relatives and other relatives of Ray Parsons are listed in the story section of Ray Parsons' web page. The Quint stories are found at that web site and you are invited to go to the Story & Photo Section. 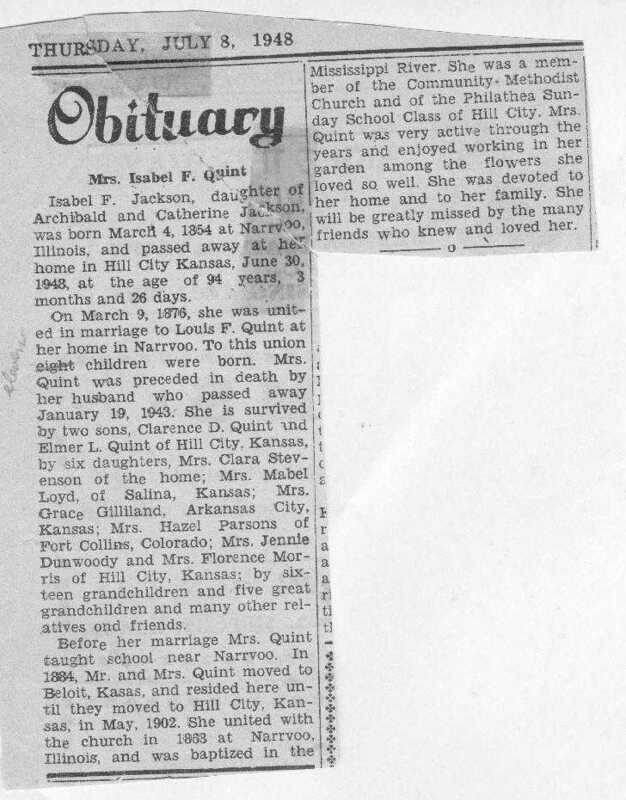 The stories tell the pioneering history of the Quint family in Kansas. They are very interesting, DON'T MISS THEM. 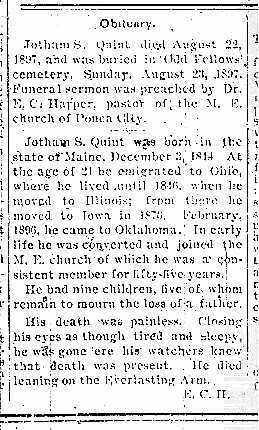 Edward H. Quint sent me 2 pages of Quint Obituaries which I scanned and placed on this web site. To see them click on the page that you wish to see. The scanned file is quite large so allow time for it to load after clicking on it. Return to this page by clicking on your "BACK" button. 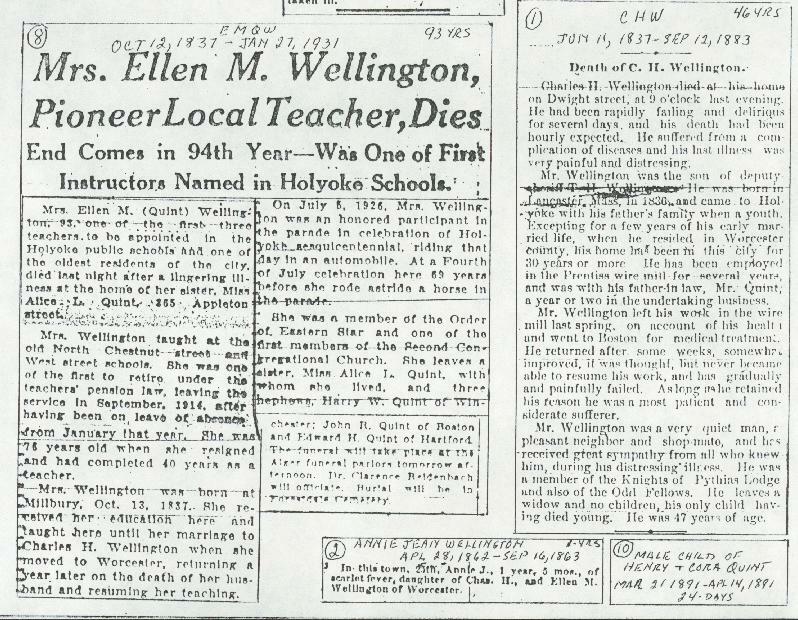 Quint Obituaries - Page 1B - Obituaries of C. H. Wellington (1837-1883), Mrs. Ellen M. Wellington (1837-1931), Annie Jean Wellington (1862-1863), and male child of Henry & Cora Quint (1891-1891). Quint Obituaries - Page 2A Obituaries of Nathaniel W. Quint (1811-1897), Mrs. Dianna Quint (1819-1906), N. W. Quint (1811-1891) and Pamelia C. Neef Quint (1811-1838). The country of origin of Thomas Quint is unknown. Some family members thought the family came from "The Isle of Man" but there was never any proof found. Philip Quint recently indicated to me that he thinks they may have come from near Trier, Germany (Click here for link to Trier city Web Site, requires internet connection) and that there are currently people with the Quint surname living there as well as a section of the area called Quint. The Quint name may have originated with Holy Roman Emporer, Charles V (also called Charles Quint) in about 1520. Click here for more on Charles Quint 1500-1558) If anyone finds verification of the tie to "the old country", please let me know about it. --- Ray Parsons.